There are three major manufacturers of wireless interconnected smoke detectors. These three brands can be found at your local Lowes or Home Depot home improvement stores. FirstAlert SCO500B 11 Photoelectric YES 7-Year Ltd Click! Kidde RF-SM-DC 0919-9999 12+ (see below) Ionization NO 1-Year Mfr Click! Nest Protect (S3000BWES) No Stated Limit Photoelectrice (Split-Spectrum) YES 2-Year Ltd Click! First Alert is one of the main manufacturers featured at Lowes.com. They are a well-recognized brand with an extensive product line. The model in the table above uses photoelectric sensing technology. This unit detects carbon monoxide as well as smoke, so you don’t need to purchase additional units for CO detection. In addition, you can network up to 11 Kidde smoke detectors, which should be plenty in most single-family homes. This First Alert model has the added benefit of allowing you to set voice location on each connected smoke detector so that when the alarm sounds across the networked devices, it can tell you the location of the device that initiated the alarm. Kidde makes very good selection of smoke detector products that are carried at Home Depot. Their smoke detector that we reference here is their wireless interconnected version. The Kidde smoke detector uses ionization technology (which we go into below). On the one hand, it does not detect carbon monoxide as the First Alert does, but Kidde does make carbon monoxide detectors that communicate with the smoke detectors. And, as noted in the table above, the Kidde can be interconnected with up to 12 other smoke detectors, but can also be connect with up to 6 more alarm-initiating devices, and 6 additional alarm-only devices. Nest Protect is the one device in this list that is also home-automation ready. It’s part of the Nest Protect ecosystem. It can communicate with nest thermostats, doorbells, and smart lights. Nest also provides a smartphone interface allowing you to check the status of your smoke detectors from your mobile device. This device uses a unique split-spectrum photoelectric detector that uses two different wavelengths of light to detect both smoldering and flaming fires. One of the features of the Nest that many users like, is its self-diagnostics. When you turn off the lights in a room with a Nest, the smoke detector givs a brief green flash to let you know that its batteries are good and it’s in working order. It also alerts you by your phone when batteries are low long before it starts to do that annoying chirp that wakes you in the middle of the night. All three of these smoke detector models offer great features. The Kidde device excels at connectivity. Though it offers connectivity of up to 24 total devices, most household applications require 6 to 8 devices at most. The Nest device is great for those who want the latest in what the smart-home technology market has to offer among residential smoke detectors. With a smart phone app, and inter-functionality with Alexa or other smart-home hubs, the Nest smoke detector provides a level of connectivity and awareness not available in other models. All of this information availability, however comes with a significantly higher price. So, it’s up to you if those additional features are worth the money. The First Alert is a great combination of functionality and affordability. We find that eleven connected devices is sufficient for most applications based on recommendations from the National Fire Protection Agency. First Alert’s 7-year Limited warranty covers most of the expected life of a smoke detector. Also, it features carbon monoxide detection, so you can buy all of one type of device. This is especially useful if you can find the First Alert in a multi-pack. The icing on top of an already very tasty cake, is the voice location feature. This feature actually brings the First Alert into the realm of functionality you get with a smart device without being one. Using it allows you to know where in your house the alarm was initiated without needing to refer to a smart-phone app. You get all of this at a price that is on par with most quality smoke detectors. When talking about smoke detectors, wired vs wireless is not about whether the device can connect to Wi-Fi, but instead whether the smoke detector is integrated with your house’s in-wall wiring or not. If yours is like the vast majority of houses, you don’t have a network of wires connecting your existing smoke detectors together, so wireless is what you need. Wireless smoke detectors are quite common. 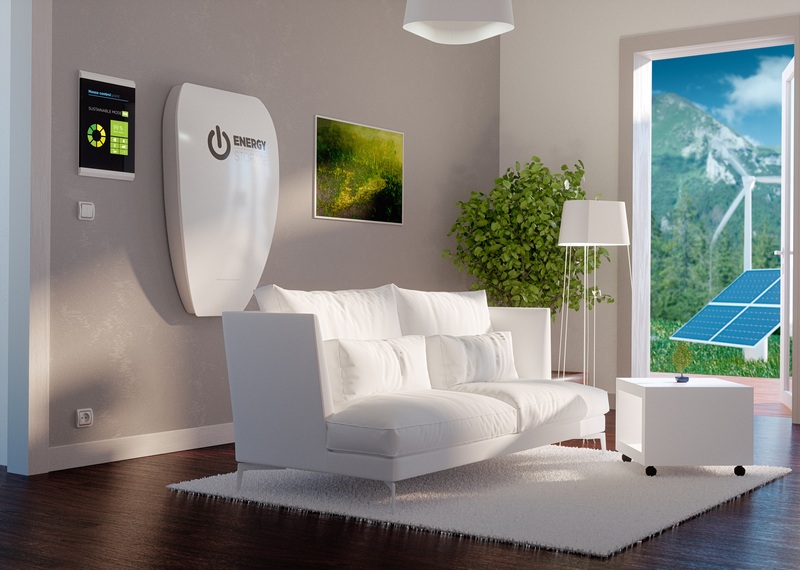 Since they aren’t connected to your house’s power line system, they rely on batteries, often of the 9-Volt or AA alkaline variety. When searching online for wireless smoke detectors, the wireless models will often be referred to as “battery-powered” as this indicates that they don’t require hard wiring. There are smoke detectors that connect to Wi-Fi, but that is not necessarily an advantage as far as the primary function of a smoke detector and alarm goes. 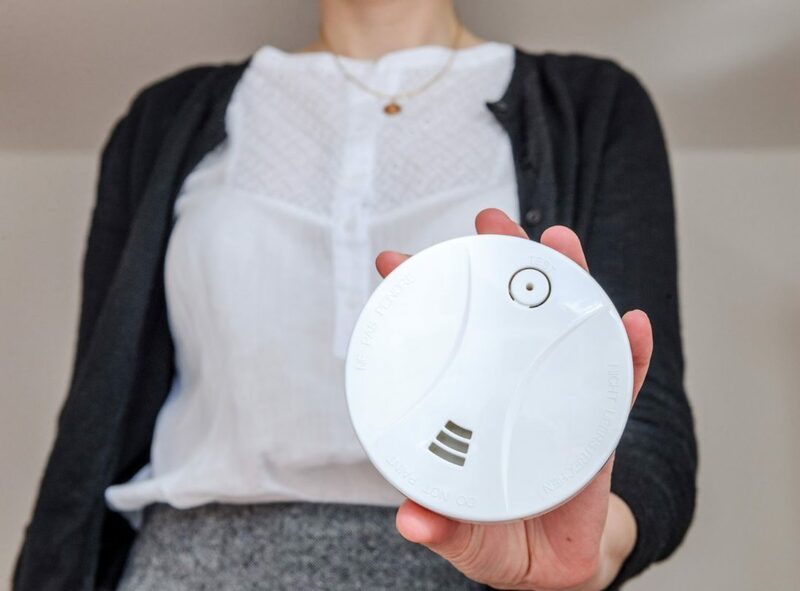 Interconnected smoke detectors offer an immense benefit over non-connected units especially in larger homes, or homes of people who may have difficulty hearing smoke alarms. Interconnected smoke detectors use radio frequencies to communicate with each other so that when one alarm goes off in one area of he house, it sends a signal to the other connected smoke detectors in the house triggering them to also sound the alarm. This way, an alarm triggered on another floor or on a distant end of the home will cause all connected alarms to sound alerting everyone in the house. This can give you and your family more time to either put out a small fire or to evacuate to a safe location and call emergency services. Smoke detector manufacturers and the NFPA describe two main types of smoke detection: photoelectric and ionization. Each of these two types of smoke detection provides its own benefit in the types of fires that it detects most readily. Photoelectric smoke detection uses a beam of light in a chamber. The chamber also contains a light sensor that is not in line with the beam of light, so that when there is no smoke, the sensor is not triggered. When smoke enters the chamber, it scatters the beam of light, directing some of that light into the light sensor triggering the alarm. Photoelectric smoke detectors are very good at providing slightly earlier warning of smoldering fires that may start more slowly. Ionization smoke detection works by creating a complete electrical circuit with charged particles in the air. When smoke enters the detector, it disrupts the part of the circuit that relies on the charged air particles, dropping the flow of electricity and triggering the alarm. Ionization smoke detectors are faster to detect flaming fires that spread quickly. The National Fire Protection Agency has levels of recommended smoke alarm usage. The first recommendation is simply to use one. Many homes don’t have a smoke detector at all, and adding even one goes a long way toward increasing the fire safety and preparedness of your home and family. The next level, is to have multiple smoke detectors. If you have more than one floor in your home, you should at least have one per floor. Beyond that, the recommendation is one smoke detector in each bedroom with one more in the area outside the bedroom such as the common hallway. The best configuration combines smoke detectors in each bedroom, common areas outside the bedroom, and all units interconnected and communicating with each other. It’s best however, to not place smoke detectors directly in kitchens, bathrooms, and garages, as units in those locations can frequently cause false-positive detection triggering what is called “nuisance alarms.” You don’t want to have to rush to shut off an alarm that was triggered by burnt toast or warming up your car in the morning. Carbon monoxide is a poisonous gas that can be created when hydrocarbon fuels like natural gas, propane, or gasoline do not combust completely. The gas is invisible and has no smell making it impossible to detect by human senses. Potential sources in your home are pilot lights for gas ovens, furnaces, and water heaters as well as running automobiles and electric generators. In high concentrations, carbon monoxide is deadly because it binds to the molecules in our blood that carry oxygen to our brains and body, causing people to lose consciousness. Many people have died from losing consciousness or simply being asleep in an environment of high levels of carbon monoxide. For this reason, it is essential, to not only protect your home from fire by smoke detection, but to also protect your family from carbon monoxide poisoning. Fortunately, carbon monoxide detectors are just as easy to acquire and install as smoke detectors. Some models actually perform both functions, which is ideal for those who can’t afford multiple units for the different purposes. Though the focus of this article is smoke detectors, we highly recommend that you also consider adding a carbon monoxide detector, especially in areas near appliances that might produce the compound such as furnaces and gas water heaters. The primary purpose of wireless interconnected smoke detectors is to keep your family and property safe by alerting you of potential fires as soon as possible. A nice-to-have feature, however, would be integration of these devices with your smart home automation system. With this feature, you not only get smoke detectors that communicate with each other, but you get a smoke detection system that communicates with you. Currently there are few manufacturers offering this technology, but here are a couple that you can find easily on Amazon.com or your nearby big-box home improvement store. First Alert makes a smoke detector that connects directly to Alexa and can be used as a smart speaker to talk to the AI platform. However, the First Alert Onelink is a hardwired device, and therefore not included in this article’s comparison. As stated above, the Nest Protect is designed specifically to integrate into a smart-home environment. It integrates into Nest’s well developed ecosystem of smart-home devices like the Nest Learning Thermostat and the Nest Hello Doorbell camera. Though it may be tempting to run out and purchase the smoke detector with the most bells and whistles, consider this before jumping in with both feet and spending an arm and a leg on the latest greatest technology. Smoke alarms are generally designed to be replaced every ten years. That is also the recommendation of the NFPA. So, keep in mind when making your purchase decision, that whatever smoke detectors you buy today, you want to plan to replace them after a maximum of ten years of usage. This is best for the safety of your family and the protection of your home and its valuable contents. For some additional information on smoke detectors, here is a link to the NFPA site’s page on smoke alarms. Here are links to the manufacturers websites for the First Alert, the Kidde, and the Nest Protect.